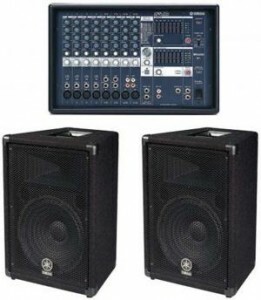 We have a broad range of reliable PA Systems comprising name-brand equipment. The smallest are our Portable PAs, the Mipro 707, a very comprehensive all-in-one unit that is battery operated. Perfect where electric power is not available. Please visit “Portable PA” page for more info. Our “iPod Party Systems” are perfect for a backyard party. Why hire a DJ when you have your favourite playlists already on your iPod or laptop. Visit “iPod-Party” to see the range. For bands we have compact and comprehensive PA systems that you can pick up and do-it-yourself. Complete with effects, eq, microphones and all neccessary stands and leads. Foldback is also available. More info at “6 channel and 8 channel PA“. We also have larger systems with all the bells and whistles. These can be delivered set up and mixed for you by experienced crew. Details on the “16 channel” and “24 channel” pages.